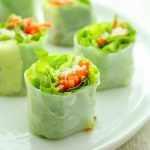 Healthy, fresh rice paper rolls filled with crunchy veggies. Perfect for dipping in peanut or chili garlic sauce! Pile your veggies onto the rice paper and gently start to roll, using your fingers to keep the veggies all tightly wrapped. I like to leave the ends undone because it makes rolling so much easier, but you can fold them up like a burrito if desired. When you finish rolling, chop the big roll into smaller sections. Dip to your heart’s content! Add all ingredients to a medium bowl and whisk to combine. Unless your name is Cheech or Chong, you’re probably not a professional at rolling things. The trick to making these easy and rolling them tightly is to leave the ends open when you roll. You don’t necessarily need to fold the ends up burrito-style – some places do and some places don’t. They taste good either way! The possibilities are endless for fillings – you can stick with what we used or switch it up completely. You could include avocado, cucumber, green onion, mango, sprouts, spinach, daikon, etc.